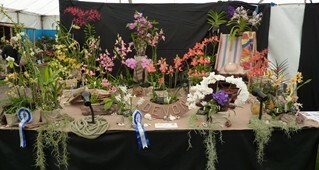 The Devon Orchid Society holds an Annual Show in May each year and in 2019 it will be held on 4th May from 10.30am to 4.00pm at the Public Hall, Budleigh Salterton, EX9 6RJ. 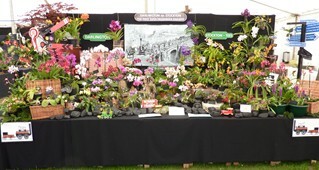 The Annual Show in 2019 will be the Society's 44th Annual Show and will be held on 4th May at the Public Hall, Station Road, Budleigh Salterton, Devon EX9 6RJ. Views of our Shows can be seen in our Galleries page. There will be potting demonstrations and free orchid growing advice, plus a tombola and a raffle, and refreshments will be available. Click here to download a copy of the Show Awards and Trophies awarded in 2018. Click here to download an abreviated show schedule for 2018. The schedule for 2019 will be issued nearer the date of the show but will be very similar to that for 2018.